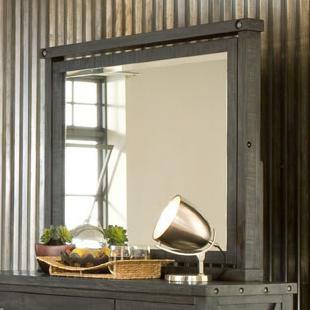 The size and beauty of this mirror will open up your room and add to the overall value of the room. The dark cafe finish, exposed screw heads and large size combine to create a mirror that will make a great addition to your bedroom. The Yosemite Rustic Square Mirror by Modus International at Michael's Furniture Warehouse in the San Fernando & Los Angeles area. Product availability may vary. Contact us for the most current availability on this product. The Yosemite collection is a great option if you are looking for Rustic Rustic Casual Casual furniture in the San Fernando & Los Angeles area.